Pick-up local, sustainably grown veggie seedlings, native plants, and food-scrap amended compost. 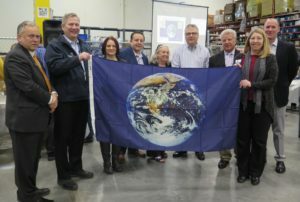 Check out these high achievers making a statement about going green: Avery Coonley School, Domtar Corporation, Naperville Park District, and CoreCentric Solutions. There are so many organizations to highlight this month! Villa Park expands safe medication disposal, Downers Grove Sanitary achieves net-zero, and Winfield Middle School and Waubonsie Valley High go green with local energy projects. Congratulations to DuPage County on achieving an Accredited Arboretum Designation for the County campus in Wheaton, IL. DuPage is the first county in the U.S. to be honored with this designation! Over the summer, included tree species will be identified with signage to encourage use of the new path connecting the Winfield train station to the County campus. Check out the full release through DuPage County Press Release. Browse over 90 submissions of art, in various mediums, inspired by pollinators at this free exhibit at the Mayslake Peabody Estate in Oak Brook. 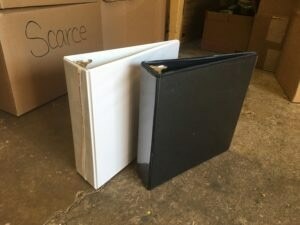 SCARCE gets far more binders than we can give away. Learn our DIY method for recycling unusable binders and other outlets for donating and recyling binders. Connect with others concerned with protecting rivers and streams in your watershed. Learn about green infrastructure and grant opportunities. Registration required by May, 8th. Join a sweep spot near you or start your own team! 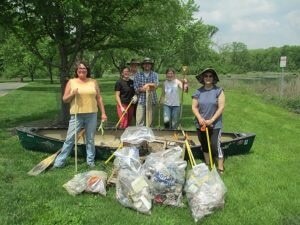 Help by picking up debris in and along local waterways or restoring nearby land back to it's natural state. Do you have material samples of carpet, flooring, or fabric? Take them to Envision Unlimited in Chicago on May 7th & 9th and materials are available to educators, students, and artists for free on May 12th. Want to know how you can celebrate World Turtle Day? Simply say no to disposable plastic straws! Disposable plastic items - including the 500 million straws used each day in the U.S. - litter our waterways and oceans harming wildlife, including turtles. Got some usable latex paint to donate? Drop it off at the Woodridge Wastewater facility starting June 25th. Hurry -in the program ends August 4th. SAP Fieldglass making Super Crayons.